Last year, 262.0 million people around the world used Twitter on at least a monthly basis, eMarketer estimates. This year, the figure will rise to 291.0 million, and 2016 will be the last year of double-digit growth in users. The social network faces pressure to grow its audience quickly, however, to support a burgeoning ad business. 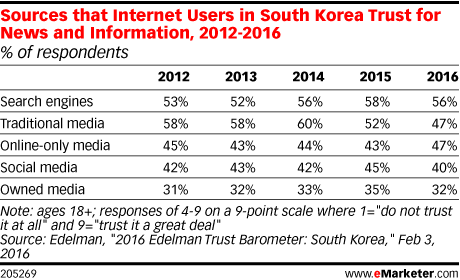 Mobile display ad spending in South Korea tilts toward apps—but not too dramatically, according to 2015 research. 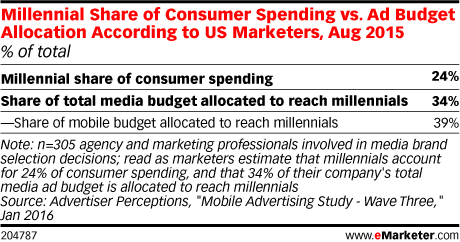 eMarketer estimates that mobile ad spending overall continues to rise at robust double-digit rates. Mobile is the most likely digital channel to see an increase in budget among marketers in Canada, according to research from December 2015. The same channel will also enjoy the largest planned increases in spending. Yahoo’s planned earnings release is being overshadowed by expectation of a major corporate reorganization and significant layoffs. While its ad revenues are expected to go up, its share of the total is not, forcing it into a tighter corner of the market. Financial institutions are facing many challenges this year, ranging from implementing EMV payments to making strategic hiring decisions. According to research, driving growth and profitability are among their biggest hurdles. Digital video advertising is a fast-growing format in China, where double-digit gains are the norm for the format. This year, according to one researcher, mobile will account for more than half of digital video ad spending for the first time. The Super Bowl remains one of the most-watched events in the US, and viewers not only tune in because of the sports, but for the ads as well. And according to research, the top five Super Bowl advertisers have spent a total of $745.1 million during the past 10 years. Google remains the most popular and ubiquitous search engine when it comes to paid search advertising in Europe. From Q4 2014 to Q4 2015, Google’s share of paid search ad spending rose somewhat, while Bing/Yahoo held steady. Mark Book, vice president and director of social content for agency DigitasLBi, talks about the specialized opportunities podcast advertising offers. LinkedIn’s global ad revenues are still rising by double-digit rates, according to eMarketer estimates from September 2015, even though Twitter and Facebook continue to grow their share of the pie more quickly. eMarketer expects advertisers in China will spend $9.29 billion on programmatic digital display advertising in 2016, a figure that sits between our estimates for the US ($21.55 billion) and UK ($4.06 billion). Have some of the “FANG” companies grown so big that further growth becomes almost impossible to achieve? eMarketer forecast in September that 2016 would be the first year of single-digit growth in worldwide net ad revenues since the Great Recession set in. Internet users in Latin America spend more of their online time with social media than their counterparts anywhere else in the world, according to research from 2015. In Brazil, usage is especially high. Despite widespread economic uncertainty in China, mobile ad spending is rising rapidly there, as marketers look to connect with the world's largest mobile audience. Charlie Wang, COO of programmatic video ad technology platform ReachMax, talks about what is driving programmatic advertising in China and the problems it faces.